Boeing has revealed the space suit astronauts will wear on missions aboard the Starliner spacecraft. Formerly known as CST-100, the Boeing spacecraft is one of two commercial crew vehicles that will eventually return a domestic crew launch capability to the United States after years of relying on the Soyuz spacecraft. That reliance will continue longer than planned, with Commercial Crew schedules sliding to the right. The earliest opportunity for a crew to launch on Starliner to the International Space Station (ISS) is in the second half of 2018. 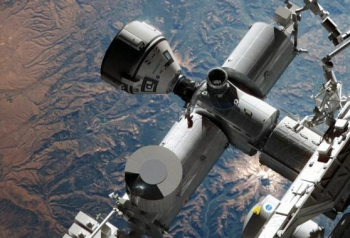 Money is forever the main challenge for the Commercial Crew Program (CCP). However, Starliner has also been interrupted by a design change, related to the OML (Outer Mold Line) for the Atlas V and Starliner design. United Launch Alliance (ULA) and Boeing revealed an updated aerodynamic configuration that provides an aeroskirt aft of the spacecraft to counter loads margins and return the stresses on the stack into acceptable flight levels. As such, the realigned schedule shows a Pad Abort test will take place at the famous White Sands test facility in January 2018, followed by an uncrewed test mission in June of that year. The “Boe-OFT” mission was originally scheduled for April 2017. A two person crew will then launch on a test mission to the ISS, a mission called “Boe-CFT” – which is understood to involve a 14 day round trip. 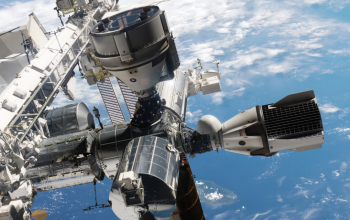 Operational flights will follow, near the end of 2018, at which point – along with SpaceX’s Dragon 2 spacecraft – NASA’s contract with the Russian Soyuz will revert to the role of back up in the event of major issues with its commercial fleet. Chris Ferguson, Boeing director of Starliner Crew and Mission Systems and a former Space Shuttle commander, noted the material is more lightweight than the Shuttle suits (Advanced Crew Escape Suit or ACES). There are other notable differences to ACES, with zippers in the torso area will make it easier for astronauts to comfortably transition from sitting to standing. 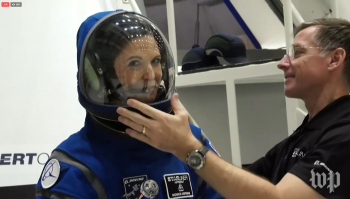 The suit’s hood-like soft helmet sports a wide polycarbonate visor to give Starliner passengers better peripheral vision throughout their ride to and from space. They will also be wearing sporty boots, created in association with Reebok. Obviously, the suit isn’t designed for EVAs, but it would provide vital protection to the crew in the event of an accident, such as in a depressurization scenario. SpaceX is yet to officially reveal its own version for Dragon 2 crews, although the company has been busily working on the path to allow humans to ride into space onboard their new vehicle. The path relates to a conducting full-scale Environmental Control and Life Support System (ECLSS) test, as part of human rating their spacecraft, to be followed by spacesuit qualification. “We’re building a flight-like capsule that we’re going to have on the ground in Hawthorne. We’re gonna put all our life-support systems on board, close the door, and make sure it works,” noted Garrett Reisman, Director of Space Operations for SpaceX at an address last year. Followed by the Delta CDR 2 (Critical Design Review), the goal is to pave the way for propulsion module testing and spacesuit qualification. For spacesuit qualification, Mr. Reisman noted that the suits will be put through a series of solo tests as well as human tests. (Image left, a notional design originally acquired via L2 in early 2015). This will then lead to the Flight Test Without Crew Certification Review, which is the final certification SpaceX needs to launch the Demo 1 uncrewed mission of the human-rated Dragon spacecraft which – at the time of Mr. Reisman’s address – was scheduled for the second quarter of 2017. Speaking of the Demo 1 mission, which is also known as SpX-DM1, Mr. Reisman stated that the flight will be a “Complete end-to-end test of the crew mission, just fully autonomous. NASA’s own approach to space suits for missions on the Orion spacecraft is heavily based on a heritage from NASA’s deep Shuttle and spacewalking experience. 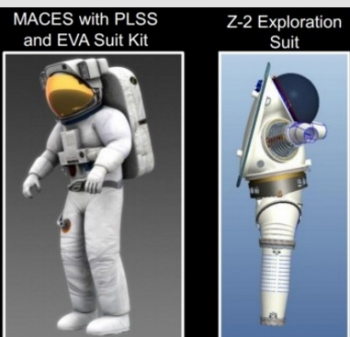 NASA’s current plan is the use of a modified version of the famous Space Shuttle launch and entry suit – or Advanced Crew Escape Suit (ACES) – for use not only during launch and re-entry for crews riding in Orion, but also for use on spacewalks (EVAs), such as during the proposed – but under threat – Asteroid Redirect Mission (ARM) in the middle of the next decade. “Orion has a certain amount of stowage and a certain amount of volume and we wanted to minimize cost by not flying an airlock. So (we thought) let’s do it all out of Orion – that’s why we ended up with this concept,” Steve Stich, head of the new Exploration Integration and Science Directorate at the Johnson Space Center (JSC) told NASASpaceFlight.com during the evaluations. 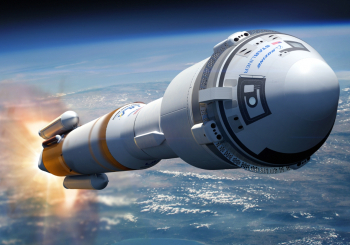 Mr. Stich noted that the Orion program had already discussed using a derived version of ACES for launch and entry, likely based on its awareness of the volume constraints. 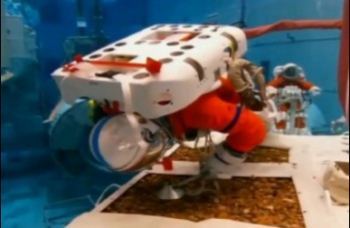 “They modified it to have what is called a suit loop interface, where it could connect to a fan that scrubs the carbon dioxide, versus the Shuttle suits that would just dump out oxygen into the cabin,” he added. 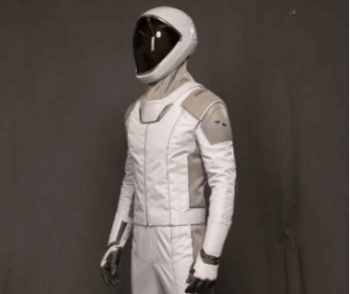 This suit – known as the Modified Advanced Crew Escape Suit, or MACES – has been in development for some time. SNC also provided a sneak preview of the suit that astronauts would be wearing on Dream Chaser missions, prior to the spacecraft being refocused on cargo resupply goals. However, that suit was deemed to be an early, notional-only design.